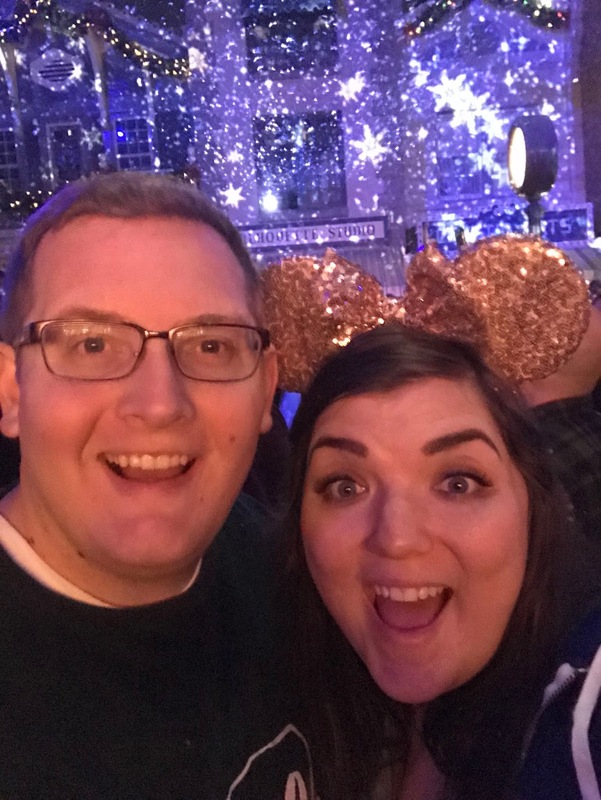 Disneyland: Christmas and my birthday!! After our trip to California in October for Zach's & my mom's birthday, I needed to come back for my birthday! We booked a trip when airline tickets went on sale and got our Disneyland package through Getaway Today! And remember how last time we did NOT like staying at Paradise Pier? I made sure we stayed as close to the park entrance as possible. We stayed at the Tropicana Inn for this trip and I could not recommend it more! It was a 5 minute walk to the gates, super clean and recently renovated. Plus it was like $130/night! We also spent part of the birthday trip at Harry Potter World & Universal - definitely my best birthday yet! 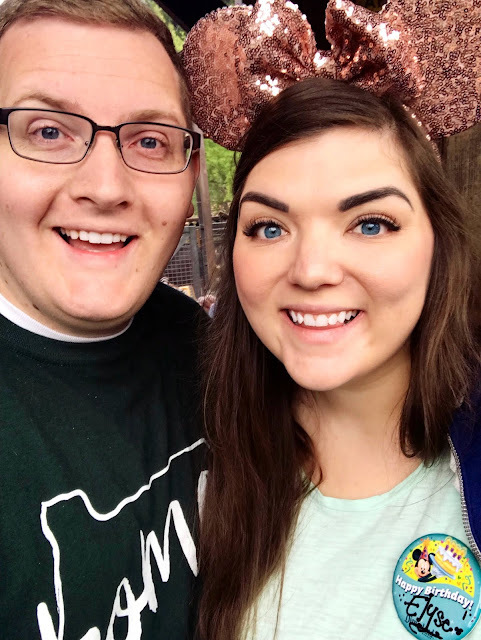 I did NOT want to turn 30, but running around Disneyland with this guy definitely made me feel like a kid again. Since we had just been recently in October, we spent this trip to Disneyland a little differently. Last time we ran ourselves ragged doing everything possible, but not really soaking in the atmosphere. This time, we only spent the time doing what we truly LOVED, trying new food, and took things a lot slower. We spent 2 days in the parks and it never feels like enough time! I cried as soon as we got there and SOBBED as we left on the last night. It was just the best trip and the best birthday of my life and I didn't want it to be over. Christmas is THE best time to be in Disneyland! It's my favorite place & my favorite holiday - what more could I want?! They go ALL out in decor, theme, food, characters, etc. Just like Halloween, they do a great job of bringing Christmas into the park without being cheesy or overwhelming. The massive Christmas trees were my favorite! It amazes me that these are all put up in one night! The Grand Californian hotel also got a Christmas makeover, with a huge tree and giant gingerbread house! Plus, not to be forgotten - the Christmas shows! We saw both the World of Color Christmas show and the Christmas fireworks show. The fireworks show is my favorite because they make it snow on Main Street! Rides are my favorite part of Disneyland and I'm usually VERY competitive about getting on as many as possible. In October, I did a ton of research about peak wait times, which rides fill up quickest, etc. But for this trip, we took it slower and didn't stress as much about it. We only went on the rides we loved: Thunder Mountain, Radiator Springs Racers, California Screamin', Soarin', Haunted Mansion Holiday, Toy Story, Pirates, Jungle Cruise & Tea Cups. Probably a few more I'm forgetting. We got the MaxPass again this trip and was so thankful to have it! Highly recommend! This is the question I get most about Disneyland: "Where should I eat?" You know that food is my #2 favorite part of Disneyland! We tried even more new food & treats on this trip. I finally got myself the famous Dole Whip Float! (I know, can't believe I hadn't had one before either...) Next time, I'll just get the whip - the juice in the float was a little too much for me. Didn't get a churro in October, so we had to grab one this time! They had awesome season flavors, but we stuck with a regular churro to split. Plus we found the Grey Stuff at Red Rose Tavern! It's a red velvet cake with a raspberry center and vanilla mousse (colored grey), all on a shortbread cookie. Excuse this picture of our messy attempts to eat it! Plaza Inn: Instead of a big birthday dinner, I wanted to go to the Minnie character breakfast at the Plaza Inn for my actual birthday. Primarily because it's a buffet and I love Mickey waffles. And I'm not super into meeting characters, but having them come greet you and interact with each other is pretty fun! I mean, where else would you see Rafiki & Winnie the Pooh tease each other?? Zach & I decided we would do this when we have kids because the characters come to every table and then you don't have to wait in line to see them in the park! Plus, did I mention endless Mickey waffles?? Perfect way to start off my actual birthday! The Plaza Inn was the only sit-down meal was had during the two days. We just kind of snacked throughout the rest of the trip. One of my new favorites is Bengal BBQ, just across from the Indiana Jones ride. They have these meat skewers, so if you're looking for something healthy-ish or a quick bite of protein, I highly recommend! Be warned - they are a bit messy though! Another spot I loved was the Cozy Cone Motel! They served a bunch of different stuff: ice cream, popcorn, etc., but we got the bread cones for our final dinner! Zach got his bread cone with chili & fritos, and I got the chicken verde with tortilla strips. We especially loved how portable they were, so we could walk & eat at the same time on our last night! One more new treat worth mentioning - hand dipped ice cream bars in California Adventure! You can pick everything: the ice cream base, the dip, and the topping! I wasn't feeling too creative, so I opted for vanilla with chocolate coating & chocolate chips. And they are SERIOUS about those toppings - check out all those chocolate chips! I said it in October and it's still true - late night at Disney is the best! Twinkling lights, shorter lines, not as hot...maximum magic! Plus we are usually pretty tired and loopy, so we are laughing a ton. We went on so many rides each night, including Thunder Mountain 5x in a row - and our train was empty every time! And the ambiance can't be beat at night - everything feels so magical lit up. My favorite part of this trip was just holding hands with Zach, strolling through the parks and soaking it all up. I still can't believe we were able to make this trip happen (and 2 trips in 3 months!). I am so grateful I was able to have this unforgettable birthday trip. I don't know if we'll ever be able to top this one!